Glory for the Mighty 3rd XV as They Claim a Hard Fought Victory in the Final of the Forster Plate! 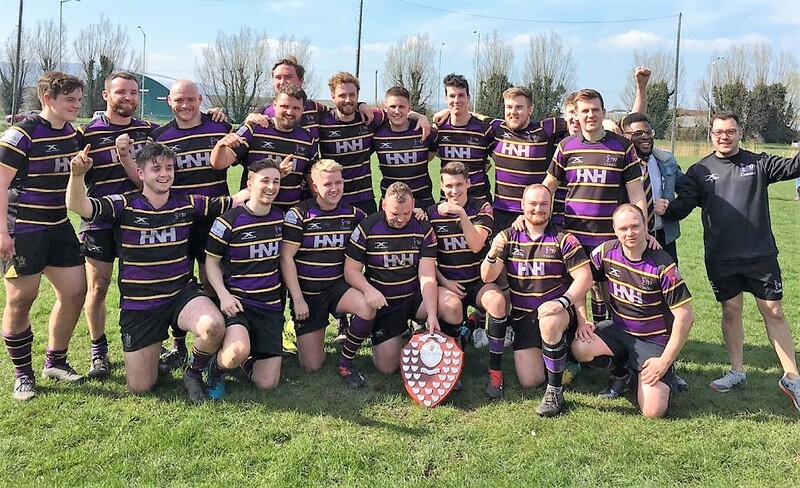 Saturday will live long in the memory for those fortunate enough to witness Instonians 3rd XV overcome Ballyclare 3rd XV by 19 points to 18 in the final of the Forster Plate competition at Holywood Rugby Club. This was a real ding dong battle between two excellent teams who gave everything for eighty minutes. The weather on Saturday lent itself to the occasion, with bright sunshine and a slight breeze coming off Belfast Lough. Instonians kicked off playing into the breeze. It was Ballyclare who applied the early pressure forcing Instonians to concede a penalty. Opting to kick to the corner, Ballyclare were showing the early intent. Good lineout defence from Peter Bradley however, allowed Instonians to regain possession and clear their lines. It was Ballyclare who struck the first blow as Instonians were penalised for a high tackle in mid field and close to the posts. The relatively straightforward kick at goal took Ballyclare into a 0-3 lead. With the kick off going straight into touch, Ballyclare regained possession, and once more went on the attack, testing the Instonians defence both around the fringes and in midfield. The work in defence from Instonians was strong and up to the task. With turnovers forced, Instonians continued to frustrate Ballyclare allowing them to relieve the pressure and to take the play back into the opposition half. Eventually the Ballyclare pressure told and an offside infringement led to another kickable penalty which was duly converted extending Ballyclare’s lead 0-6. Having received the kick off Ballyclare were penalised for crossing. Seeing the opportunity Instonians opted to take the penalty quickly as Finlay Bodel set Rab Brown off on a charge. Peadair Meenan was next to take the ball on driving hard at the defence. Quick ball from the ruck was moved through the hands to Sam Fryers who made an excellent outside break. With a perfectly timed pass, Sam sent Jerome Hannan of on a run up the wing. As has been the case on numerous occasions this season, Jerome showed his deceptive pace and power as he stepped inside the first defender and powered his way over the line in the corner for Instonians first score of the match. With the conversion falling short, Instonians were back in the game 5-6. At this stage with twenty minutes gone the match was being played at a frantic pace and the quality of rugby being played by both teams was worthy of any final. It was Ballyclare who struck next as they moved the ball though numerous phases before taking advantage of a gap on the blind side to dart over for a try close to the posts. With the relatively straightforward conversion missed Ballyclare retook the lead 5-11. Heading towards half time Instonians knew they needed to score next. From a scrappy Ballyclare lineout on half way, Instonians regained possession. Seeing the opportunity, the quick ball was fed across the backline to Joe Murphy who made good ground, taking play deep into the opposition twenty two. With the momentum, and the Ballyclare defence scrambling, Instonians changed the direction of attack and moved the ball quickly back across the field to Captain Peadair Meenan loitering in an outside channel where he crashed over for Instonians second score of the match. The successful conversion took Instonians into the lead for the first time in the match, 12-11. Instonians were now beginning to play with confidence and having good success in the backs with Joe and Sam Fryers causing the Ballyclare defence all sorts of problems. On the stoke off half time following some good work in midfield, Joe Murphy was once more put into space , making good ground, Joe took play into the Ballyclare twenty two. With some excellent continuity play on display from both forwards and backs, Instonians were able to retain possession and take the ball through numerous phases. The resolute Ballyclare defence was standing firm and it was a short pass from Finlay Bodel to Aaron Davis which eventually breached the defensive line. With the play now in behind the defensive line, Aaron’s momentum took him up to, and over the line for Instonians third try of the match. Post-match, Aaron did have a slightly alternative view on how the try was executed, as he discussed at length how his, “pace, agility and awareness made the difference, and that not every player would have been able to finish off the move”. Needless to say his team mates were vocal in pointing out that they had a slightly different view on proceedings. With the conversion once more successful Instonians went into half time leading 19-12. Instonians began the second half with a slight wind advantage and were quickly into their stride. Once more Joe and Sam Fryers who were both having excellent games, carried strongly in attack and put in strong challenges in defence. Using the advantage of the wind, Ashley Black and Joe Murphy cleverly used the kicking option to pin Ballyclare into their own defensive area. As the second half progressed, play began to become a little scrappy, due mainly to the impact that the high pace and intensity the game was having on both sets of players. This also began to impact on the discipline as Instonians were guilty of conceding several penalties, giving Ballyclare the opportunity to attack. To Ballyclare’s credit, they did continue to move the ball and send strong runners at the Instonians defence. After a sustained period of possession for Ballyclare, the Instonians defence was coming under severe pressure. With Ballyclare pounding the Instonians defensive line space opened up in a wide channel. What looked like a certain try was thwarted by a try saving tackle by Peadair Meenan and Joe Fryers. Once again the defensive efforts allowed Instonians to clear their lines. The momentum was now with Ballyclare as they pushed for a try which would bring them right back into the game. Their efforts were rewarded as a mid-field break close to the line led to a try under the posts. With the conversion successful, Instonians lead was cut to one point as the game moved into the final ten minutes. 19-18. Having played seventy minutes of high paced rugby, it would have been understandable for both teams to have struggled to maintain the intensity. This was not the case on Saturday, Both teams recognised that ball retention was key to success, therefore kicking possession away was not an option. Despite fatigue both teams threw everything at each other and continued to play some great rugby which was appreciated by the large crowd. Into the final minutes and Ballyclare once again took the game to Instonians, as they looked for a way around or through the strong defence. With two minutes to go the Instonians defence creaked as they conceded a penalty almost in front of their posts. With one point in the game, Ballyclare rightly opted for a kick at goal, which would surly secure the victory. It wasn’t to be however, as the Instonians squad firstly held their breath and then breathed a sigh of relieve as the kick at goal drifted just wide of the upright, leaving Instonians clinging onto a one point lead. Ballyclare weren’t done however, and from the twenty two meter drop out they once again went in search of the winning score. It was the defence which eventually made the difference as after several phases and some big hits Ballyclare knocked on close the Instonians line. This was to be the last play of the game as the referee blew the final whistle to bring to close what was a classic cup final, and a fantastic victory for the mighty 3’s. Saturday’s match showed just what the 3’s are capable off. With only one narrow defeat since Christmas the majority of matches have been won through their ability to play a fifteen man game, and to score trys at key moments in matches. Saturday once again showed how clinical the squad can be with ball in hand. However; Saturday’s victory should not be defined by the work done when in possession alone, Saturday’s victory should also be defined by the work the squad put in when they didn’t have the ball. The defensive effort by the whole squad needed to be solid, and on Saturday they didn’t disappoint. Time and again Ballyclare attacked and time and again the defence stood strong, and they got their rewards. The 3’s squad have developed a real bond as the season has progressed. This was typified on Saturday as they showed a real determination to fight for each other right until to the final whistle. Cup finals are harsh as there can only be one winner at the end of the day. Ballyclare on Saturday played some fantastic rugby, and more than played their part in what would have been a great game of rugby to watch for the neutral. The level and quality of rugby played by both teams on Saturday was a great advertisement for provincial junior club rugby. The quality of the rugby on Saturday was also helped by the match officials. Our referee and his assistants were consistent with their game management and with their decision making, which allowed the game to flow from Start to finish. Thank you also to the many Instonians supporters who made their way to Holywood on Saturday to cheer on the 3’s, your support was much appreciated, and hopefully you enjoyed both the performance and the result. To the Branch official thank you for taking the time to attend the match and to present the trophy. Finally thank you to Holywood RFC for hosting Saturday’s match, which was a great venue for a final. However, if you happen to find our three match balls lost in the trees behind the dead ball lines, maybe we could get them back. This brings the curtain down on what can only be described as successful league and cup campaigns for the 3’s. 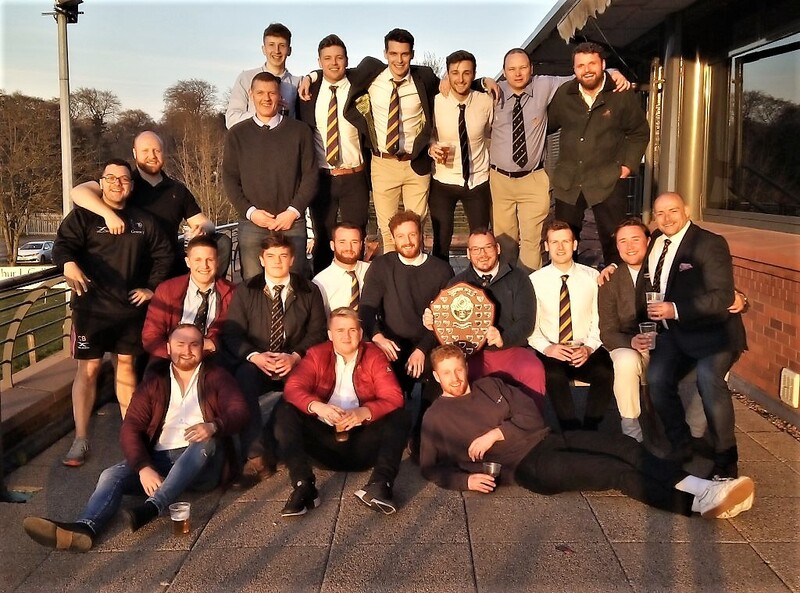 Having been promoted after last season, the 3’s currently sit in fourth position in the league and finished with a trophy, can’t really ask for more.